When the Australian Government was overthrown a few days ago, nothing and nobody Russian was blamed in the local media for interfering. According to the ousted Liberal (conservative) Party Prime Minister Malcolm Turnbull, the “insurgency” was a plot by media owned by Rupert Murdoch and a group of conservative MPs led by Peter Dutton, an ex-vice squad policeman who shaves his skull and has run Australia’s secret services with an order to roll down their shirtsleeves to conceal their tattoos. Murdoch and Dutton failed. For the time being, power has been taken by a religious zealot called Scott Morrison. His belief in God speaking in tongues has, so far, not led his own tongue to wag blamefully in Russia’s direction. The absence of fake news about Russia might have been news in Australia had not the national consensus on Russia-hating been comprehensive, covering all the political parties, factions and ethnic lobbies; all the media, mainstream, alt and social; and all the universities and think-tanks, so there’s no advantage for anyone to repeat the obvious. Posing tough has been Australian foreign policy since the 19th century when the British colonies – now a federation of states – volunteered as many soldiers as they could muster to try out in the Mahdist War (Sudan), the Boer War, the Boxer rebellion, even the Russian civil war. Turnbull’s predecessor prime minister, Tony Abbott, was an exponent of the pose when he announced that if President Vladimir Putin came to Australia for the G20 summit meeting in November 2014, he would “shirt-front” him. That’s a term for an outlawed tackle on the football pitch. When Putin arrived and they came to the clinch, Abbott dropped the pose, while his military chief of staff tried to belittle the nuclear-armed Russian naval squadron which stood offshore during Putin’s visit to Queensland; for that story, read this. Prime Minister Tony Abbott greets President Vladimir Putin at the G20 summit, November 14, 2014. Watch carefully – Putin allows the conversation to take place in English, without interpreter. Abbott had already been forced to drop another pose. That was to send 3,000 Australian troops to eastern Ukraine in August 2014. The NATO command nixed the operation, so Abbott sent 200 Australian spetznaz instead. Exactly what they did, and where, remain state secrets, at least in Australia. Australian think-tankers have hinted at the option of sending Australian troops to the Baltic state side of the Russian frontier, but not now, not soon, not in public. The reason for this reticence isn’t a lack of Russia-hating conviction. It’s simply that the Australian military-industrial complex and the state budget for the security services are as flush as can be with outlays for fighting much closer adversaries – China, the source of Australia’s economic prosperity, and Indonesia, the source of illegal immigration. There is also no trade or investment reason left for a reassessment of Australian policy towards Russia. Talking tough on the Ukraine and Syria war fronts allowed the Australian Foreign Minister, Julie Bishop, to cause the loss of A$200 million in Australian exports of foodstuffs to Russia; for details of the Russian counter-sanctions, click. No domestic votes were lost by that pose of Bishop’s. The significantly more valuable Australian export to Russia – alumina for Oleg Deripaska’s Rusal amounting to 10% of Australia’s total alumina exports or about A$750 million — was quietly preserved by Canberra until the US sanctions were announced against Rusal on April 6. 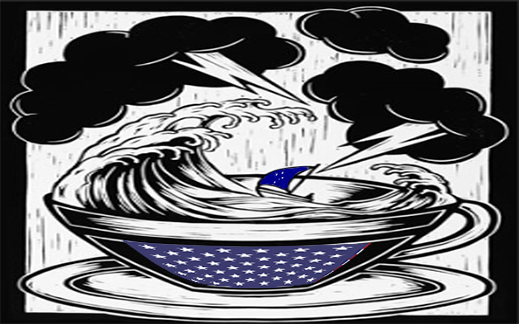 When the Americans decide on what terms trade can be resumed with Rusal, the Australians will do what they are told. In the meantime, the price of Queensland alumina has risen sharply to compensate for the reduction in volume of production and exports. Bishop was described last week by Turnbull as “Australia’s finest Foreign Minister”, as she was purged at the same time as he was. In retrospect, on Bishop’s foreign policy success list a Sydney think-tank rates her attacks on Chinese military manoeuvres in the South China Sea ahead of her United Nations campaign against Russia. In the larger space outside Australia, Bishop’s vocable pose-striking has been inconsequential. In its review of Dutton’s foreign policy postures, the same local think-tank has failed to detect Russia at all. On the government’s front bench in the Australian House of Representatives, before the ouster (left to right): Malcolm Turnbull, Julie Bishop, Peter Dutton. Bishop has told an Australian journalist that at a tea-only reception for foreign ministers in Cambodia, Russian Foreign Minister Sergei Lavrov “ ‘bribed a waiter to put scotch into my teacup. Lavrov is evil,’ she says by way of explanation.” She also told the reporter: “her proudest achievement was confronting Vladimir Putin after Russian-backed rebels in Ukraine shot down the civilian airliner MH17.” Prime Minister Turnbull has relied on secret Australian and US intelligence reports to refuse to pay state compensation to Australian families of the Malaysian flight victims because the intelligence does not substantiate Bishop’s public allegations. For this story, banned in the Australian media, click to read. For Australians to keep voting for the pose without comprehending the price, the Australian media and universities have successfully censored and silenced all independent reporting on Russia. Here’s a test of that in 2013, after an Australian was arrested and imprisoned in Murmansk and St Petersburg for being the radioman in a Greenpeace operation to occupy a Russian oil rig in the Pechora Sea. 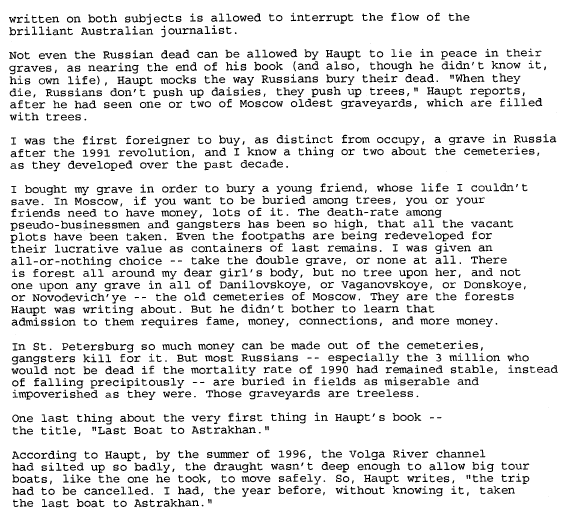 As the first Australian reporter to establish a bureau in Moscow in 1989, and the only one to continue, the Australian media ban on me started first. 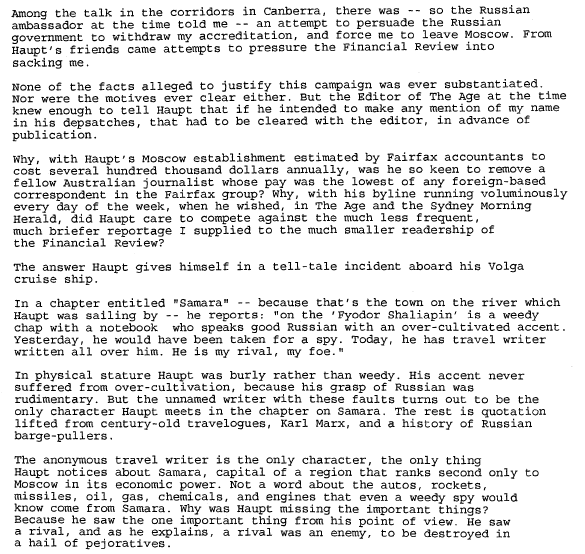 What I didn’t know when it began was that the impetus came from other Australian journalists and their editors, who tried to persuade the Russian ambassador in Canberra to cancel my visa. This is the story of why that was done, and how, by an Australian reporter to arrive in Russia after me; his Russia-hating stand has proved to have greater longevity than he did. His name was Robert Haupt (right). 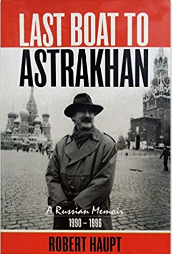 His Russia-hating book, The Last Boat to Astrakhan, published posthumously in 1998, was celebrated by his friends in his old newspapers as “a distillation of his shrewd observations about the forces of change he witnessed”. It can be ordered from Amazon at the remainder price just $2.96. 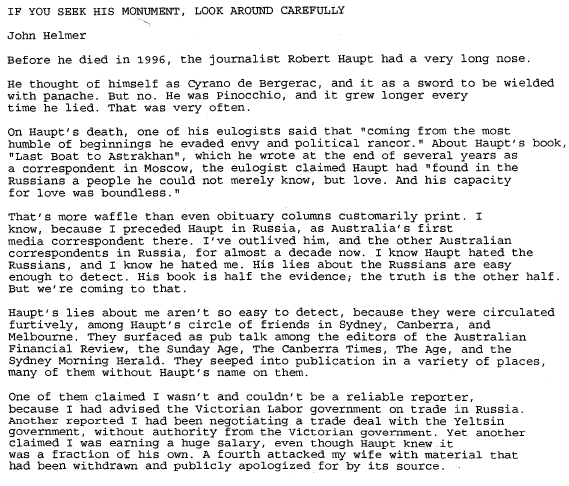 This piece about Haupt was written for an Australian intellectual quarterly called Quadrant. The manuscript was lost in old files until rediscovered yesterday. Quadrant refused to publish.